It is with great pleasure I join you at this Asia House dinner tonight. I give my warmest thanks to Mr. Victor Chu for his gracious invitation. I welcome this opportunity to sit down with so many friends, old and new, to discuss issues of common interest. Yesterday, I gave a speech at the Chinese University of Hong Kong. I outlined some general views on the relations between China and the West. I pointed out the opportunities and challenges in the fast-moving and interdependent world we inhabit today. Then I stressed that these realities create a compelling case for more communication, understanding and cooperation between China and the West. In this context, Britain and Europe are high priorities for China. That’s why tonight I want to share with you some thoughts on China-UK and China-Europe relations. I will start with the China-UK relationship. In just under two years as Ambassador, I have witnessed how this relationship has gained further momentum. · The change of government in Britain last year resulted in continuity in terms of commitment to a strong partnership with China. · The premiers of our countries exchanged an official visit. · Sino-UK cooperation is reaching greater depth in a broad range of areas. · And a higher level of understanding is being built between our peoples. Overall, these developments are providing stability, depth and balance to the China-UK relationship. First, the political relations are growing deeper. There’s an emerging consensus between Chinese and British leaders that respect and equality are the anchor of a steady relationship. I could sense that this principle has trickled down through my day-to-day dealing with British government officials and MPs. China and Britain are coming to accept that we may disagree in certain aspects, as we come from different social systems, cultures and values. In addition both China and UK are learning to manage differences. People have begun to recognise that lecturing or blaming the other side is not helpful. Instead there is growing commitment to make progress through constructive dialogue. Over the past year China and Britain have developed wider channels of dialogues than ever before. · The annual Prime Ministers’ meeting. · An Economic and Financial Dialogue. · The Leaders of the Future Forum. · And a Young Leaders Roundtable. All of these exchanges provide good settings for direct in-depth dialogues. At the same time, China and the UK are working closely on their global responsibilities. Both countries are permanent members of the UN Security Council. Both are important players in the G20 as well as other multilateral forums. These international roles give China and the UK front-row seats in the global system. It means both countries have an interest in strengthening their active roles in world political and economic affairs through cooperation. In summary, this stable political consensus provides conditions for building healthy overall relations. Second, we see a stabilising and balancing of our commercial relationship. This is reflected in two fields. China-UK trade is on a path toward greater balances. For years, China has been in surplus in the trade in goods with Britain. But the picture is changing, as British government and businesses look to further explore and increase exports to the Chinese market. For instance, Britain’s export to China last year recorded a 40 percent year-on-year rise. And in the first three quarters this year, it has jumped just under 30 percent. That’s faster than any of Britain’s top 15 export markets. Now, both our countries are working hard to balance our trade. Premier Wen Jiabao and Prime Minister David Cameron have agreed a target of 100 billion US dollars of bilateral trade by 2015. On the investment side, our two-way investment is in greater balance. Britain has been the number one EU investor in China in recent years. By last August, its paid-in investment in China reached 17.5 billion US dollars. By contrast, China’s investment in Britain is just getting off the ground. By last August, China invested just over 1.3 billion US dollars in Britain in non-financial sectors. What’s encouraging is that the bulk of this investment was made in the past couple of years. And China has moved up Britain’s foreign investor’s rankings to the seventh place in 2011. Going forward, Chinese investors will continue to look to Britain as a major destination in Europe. And Chinese capital inflow will further grow and diversify into wider sectors. In addition, more Chinese enterprises will base R&D centres and European headquarters in Britain. The latest example of a long list of such cooperation opportunities is the UK-China Infrastructure Investment Conference. This was held in London earlier this month. This meeting offered an excellent forum for Chinese and British officials and investors to explore investment opportunities in transport, communications, green energy and urban development projects. Third, the mutual understanding is increasing. Here I must be frank. Mutual understanding is an area where Britain has been in deficit for a very long time. There are 120,000 young Chinese studying in Britain. Tens of thousands of them come back to China every year bringing a deep grasp of all aspects of the UK. This is in addition to over 200,000 Chinese tourists going to Britain each year and more than 400 million Chinese learning English. So, it’s fair to say that in terms of language, history, culture, economics and society, the Chinese people have developed a good understanding of Britain. At the same time, we have borrowed some pretty good practices from Britain. The recent example is that we introduced a Chinese version of Britain’s GP system, or General Practice, to enrich our own medical services. In sharp contrast, Britain’s grasp of what’s going on in China remains far from adequate. The British public’s understanding of China seems to be largely influenced by the reporting of a few broadcasters and newspapers. This offers a very narrow perspective on China. Quite often the reporting and analysis results in negative and one-sided stories pervading the UK media. Despite this media coverage there has been some notable progress. Britain’s understanding deficit, very much like its trade deficit, is shifting too. · A strong enthusiasm for learning Mandarin is sweeping through Britain. More than ever before, British young people are considering China as a place to study. I was delighted when a British student won the first prize in the ‘Chinese Bridge’ Chinese Proficiency Competition. · Chinese cultural events are attracting more extensive interest in Britain. One remarkable example is the Chinese art troupes’ first participation in the Edinburgh International Festival. These were The Peony Pavilion by the National Ballet of China and The Revenge of Prince Zi Dan by the Shanghai Peking Opera Troupe. Both these performances won plaudits from the audience. · A pair of giant pandas will soon settle into their new home at the Edinburgh Zoo. · Next year, China and Britain will celebrate 40 years of full diplomatic relations. 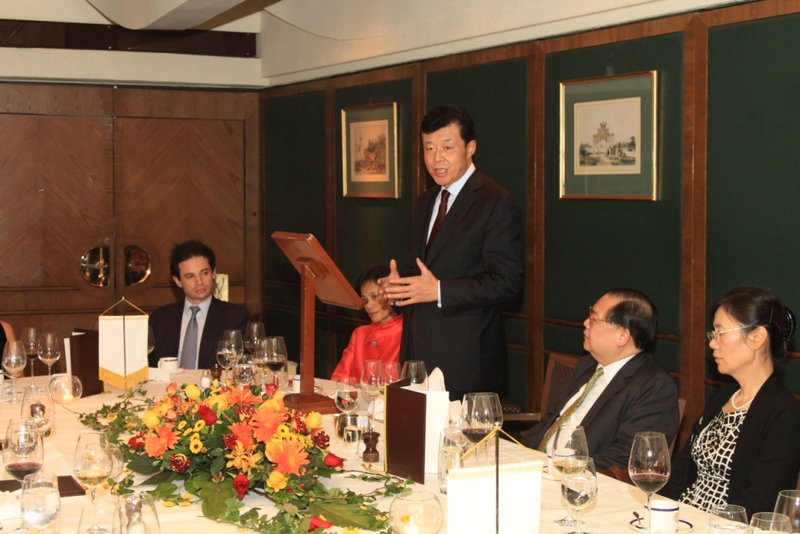 · And China has been named the Guest of Honour for the 2012 London Book Fair. We hope to use these positive developments and high-profile events to build a better understanding of China in the UK. To sum up, greater stability and balance in these three major areas is the result of the ever deepening of our bilateral relations. I have confidence that this progress will in turn drive further positive growth in China-UK relations. Now, let me turn to China-Europe relations. On the whole, our ties with Europe are on a similar upward track. Yes, some disputes may come up between us, particularly in the area of trade. But the larger picture is that China and Europe are already each other’s biggest trade partners. Any discussion about Europe will turn to the three year old financial and debt crisis. As you are well aware, that is rapidly spilling over the borders from within the EU. It is a major topic between China and Europe. So let me say a few words about China’s perspectives. We believe that despite the financial crisis the European Union is still the world’s largest economy. As such the EU remains an important force in the world and China’s important partner. We have a stake in the EU getting back to its feet. Second, about the European debt crisis. We believe in the EU’s wisdom and ability to clean up its debts. The EU itself increasingly recognizes this. The comprehensive package put together by the EU last month was the best proof of its determination. What matters now is action. The world is watching how Europe can push through institutional reform and implement fiscal consolidation. Third, about how China could help Europe. We Chinese have a saying, ‘the one who ties the knot should untie it’. It is Europe who should put its own public finances back in order. China, on its part, will continue to play a constructive role in stabilizing global financial markets and restoring world economic growth. Let me point out one way China is providing help. That is to reinforce our win-win partnership with Europe. China is committed to expand two-way trade and investment and the scientific and financial cooperation with our European partners. It has been my purpose this evening to try and give you a perspective from Europe and the UK. I hope you may find my remarks useful. Now, I’m very happy to take some questions. In turn these may help me learn from this distinguished audience about Hong Kong’s attitudes towards UK and Europe.